Takes big-aperture astronomy to a new level of performance and user-friendly fun! Locate more than 14,000 fascinating celestial objects with pushbutton ease with optional controller! The XT12 arrived unassembled in many boxes. All of the boxes appeared to protect every thing well except the base of the Dob. This was somewhat damaged and a little wood glue corrected the problem. It was of little concern cosmetically and did not affect the function of the scope’s mount. The options obtained were the padded transport case and the Computerized Object Locator. Assembly of the base went easy using the instructions provided and a few tips Sky and Telescope article provided on the XT8. The Optical Tube Assembly showed precious indications that this was not a beginner’s scope. The secondary mirror is a 97mm by 70mm oval that needed to be aligned under the eyepiece. The Mirror did not come assembled in the OTA but in a separate box, and had to be installed in the OTA. The instructions were easy to follow for assembly. Collimation for this scope is another matter. For any Newtonian Reflector (scope over 8″ / 200mm) the owner needs to be concerned with what they call “the offset” of the secondary mirror to the center of the focuser. If the offset is not directly under the center of the eyepiece it deteriorates the image, detail features of the planets suffer the worst. Bending light (the focal cone of the primary) at 90° incorrectly presents this problem. The lower part of the secondary comes in contact with the light further down the primary’s light cone than the trailing edge. So, the center of the cone is further away from the lower edge (nearest to the primary mirror) of the secondary than the top edge. This is the “Offset” and a little too much for beginners to set the secondary properly. The center of the focal cone is not physically centered in the secondary, but appears to be when observed from the eyepiece. This can give season armatures some minor problems to resolve. Collimation is the process to optically align the eyepiece to the center of the focal cone. This procedure has cause many debates among amateurs which methods are better. Collimation of a scope this size can be done three ways. I prefer the laser collimator. To use the Laser collimator correctly, you must know exactly where the “Offset” is spotted on the secondary from the focuser must be a 3mm offset at the secondary or 45.5 mm from the forward edge and centered on the secondary. The XT12 is a closed-tube telescope, which requires a deluxe model laser collimator in order to adjust the primary from behind the scope and see where the laser is being reflected back at the focuser some three feet away. The rest is straightforward. Weighing in at about 83 lbs. with a 4′ 10″ long tube weighing more than half this, safe transportation to a dark site is a concern. The padded case, although expensive, seems to be a necessity for transportation. This makes it a lot easier for transport in the bed of a pickup or banged around in a car. The case comes with a shoulder strap for carrying the OTA, which is paramount in the prevention of back injuries. Site setup is another concern, especially in using the Computerized Object Locator. The base must be level, and the tube vertical stop needs to be set correctly for the Object Locater to obtain objects. A suggestion for a quick backyard setup would be a level 36″ X 36″ concrete slab used for step ways, obtainable at any home improvement or garden shop. The Object Locator devise does not find the planets due to internal error, but using it on Deep Space Objects works better than one expects. With clouds closing in we picked out 23 DSO’s within an hour for 6 people to view. A nice option and reasonably priced for any level amateur. Although this option is not necessary for seasoned amateurs, it speeds things along in locating DSO’s not having to get maps out. It is a convenience. Optics – The mirror and secondary are of very high quality, which this 50-year of amateur astronomy finds remarkable for a commercial mirror. An at-home knife-edge test will detect defects in the mirror figuring, but only up to 1/8 wave. The XT12’s mirror goes beyond this, and an educated guess places it around 1/15 wave. The images that were obtained later say the same thing. (Nice optics) Plössl is not my eyepiece of choice. The 25mm is not that bad of an eyepiece, but the 10mm scarred light. 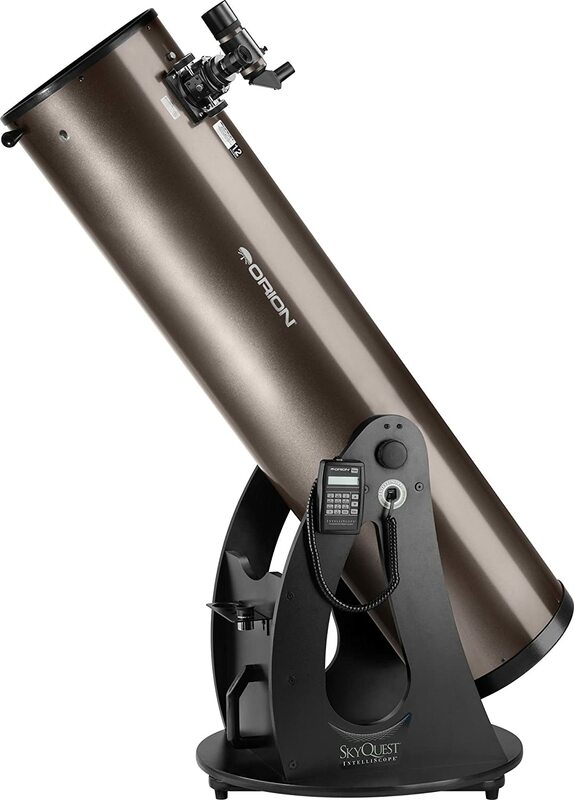 With a telescope this costly, I would like to see at least the Highlight series of Orion’s line of eyepieces be offered. Both eyepieces provided don’t do the scope justice. Saying that, they would still delight a novice. My age, experience and eyesight also contribute to this opinion. You get spoiled with premium wide field eyepieces that make it hard to be objective to lesser performing ones. Later on novice will learn that the eyepieces to the telescope will be ¾ of the equation. To bad the companies whom sell these have not caught on yet, or able to get away with not knowing. We tested out the XT12 with Televue Nagler, Panoptic eyepieces and a Televue BIG 2X Barlow. This is a very worthy scope and performed well with these. My wallet did not perform well obtaining such eyepieces. They are pricey. M42 – Very good detail even under the Dallas area light polluted skies. The Trapezium showed five stars easy and some red in the nebulous cloud using a 19mm Panoptic. M31, M32, and M110- Very easy under bad conditions, M31 revealed a dust lane and M110 was cut in half by a dust lane 27mm Panoptic. The planets – The key to a telescope’s performance is in the detail seen on the planets when you “Push” the power limits of the scope. Proper collimation is a must in obtaining planetary detail. We used a 7mm Nagler with a 2X Big Barlow with a 2″ extension of the Barlow that gives a 3.15X. This brought the power to 675X on Jupiter and Saturn. Tracking by hand gets a little tough at this power but the tension controls are a lot better than most DOBS on the market and the bearings were smooth. Tracking and getting proper focus is a little tough. The electric focus device seems to be a good idea for this sort of magnification. The image held to reveal features within the SEB/NEB of a rusty type of brown. Saturn showed seven moons, two divisions of the rings with hints of others, and the central band was a light yellow. Many say using filters for DSO’ on a scope this size, you will be limited to the UHC and the narrower OIII should be used on scopes 16″ or grater. I have a feeling this scope would hold up to using the OIII. Like the XT10 before it, the XT12 will make an impression on the Amateur Astronomy community. Not a beginner scope by any stretch of the imagination. Suggested maximum size scope for a beginner would be limited to 8″ / 200mm for learning how to care and use a scope. The XT12 is a nice second scope or step up. The quality of Orion’s dream scope sets the bottom line to just one question, “Would you purchase this product again?” My answer is “yes”, without reservation.